FEMA Drops 'Climate Change' From Its Strategic Plan : The Two-Way The agency's strategic planning document does not mention the potential impact of a changing climate on the rising risk of natural hazards. 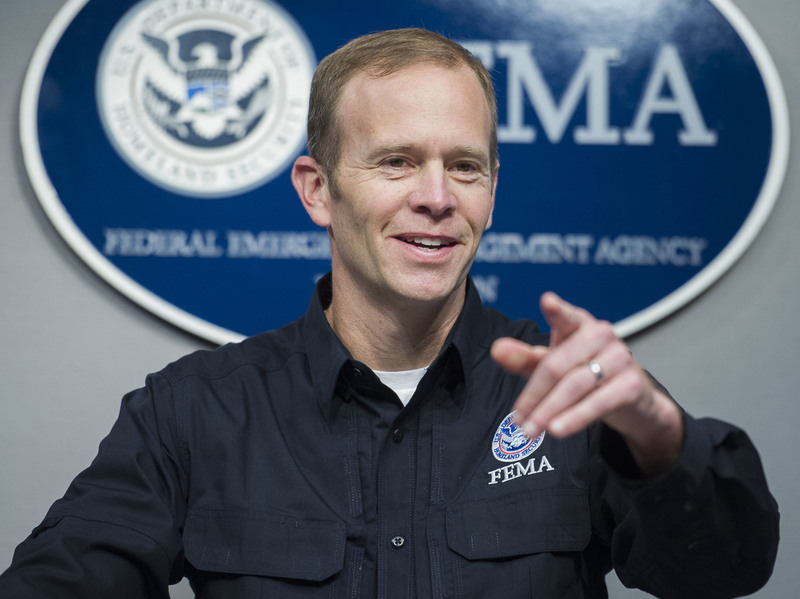 Federal Emergency Management Agency Administrator Brock Long. The Federal Emergency Management Agency, the federal government's first responder to floods, hurricanes and other natural disasters, has eliminated references to climate change from its strategic planning document for the next four years. That document, released by FEMA on Thursday, outlines plans for building preparedness and reducing the complexity of the agency. "Disaster costs are expected to continue to increase due to rising natural hazard risk, decaying critical infrastructure, and economic pressures that limit investments in risk resilience. As good stewards of taxpayer dollars, FEMA must ensure that our programs are fiscally sound. Additionally, we will consider new pathways to long-term disaster risk reduction, including increased investments in pre-disaster mitigation." The document does not say what could be contributing to "rising natural hazard risk," or what conditions could require the "increased investments in pre-disaster mitigation." Similarly, under a section about "Emerging Threats," the document cites cybersecurity and terrorism. There are no references to global warming, rising sea levels, extreme weather events or any other term related to the potential impact of rising surface temperatures. "It is evident that this strategic plan fully incorporates future risks from all hazards regardless of cause. Building upon the foundation established by FEMA's previous two Strategic Plans, this plan commits the agency, and the nation, to taking proactive steps to increasing pre-disaster investments in preparedness and mitigation." The agency's Strategic Plan was issued with the signature of Administrator Brock Long. "Brock Long, whom President Donald Trump appointed to run FEMA last year, has equivocated on whether climate change is real and man-made. 'The term climate change has become such a political hot button that, I think, I keeps us from having a real dialogue,' he told Bloomberg in an interview last summer."